W.Bro. W. J. Lendrim, V.C., P.G.P. The history of Albert Edward Lodge would not be complete without due honour and mention being given to this extremely brave and popular soldier. 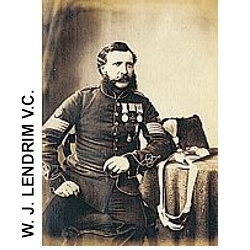 William James Lendrim had 46 years of Military Service, the latter half of which, until his death in November 1891, was spent as Instructor of Field Works at the Royal Military and Staff Colleges and Sergeant Major at the latter establishment. The outstanding acts of gallantry which earned the award of the order The Victoria Cross make extremely interesting reading, indeed the whole career of this military man is absolutely outstanding. Intrepidity-getting on top of a Magazine, and extinguishing sand-bags which were burning, and making good the breach under fire, on the 11th April, 1855. For courage and praiseworthy example in superintending 150 French Chasseurs, on the 14th February, 1855, in building No. 9 Battery, Left Attack, and replacing the whole of the capsized gab ions under heavy fire. Was one of four volunteers for destroying the farthest Rifle Pit on the 20th April. Corproal Lendrim was among the first to be awarded this new award for bravery, the actual ceremony with full Armed Forces participation took place at Hyde Park on Friday, June 26th, 1857. Her Majesty Queen Victoria personally pinned the plain bronze cross, with red rib and for the army and blue riband for the Navy, on to each breast of the officers and men of the Royal Navy, Royal Marines and Army. At his death Bro. Lendrim left a widow and 12 children, 8 of whom he had succeeded in “placing in the world” (The Times Quotation). 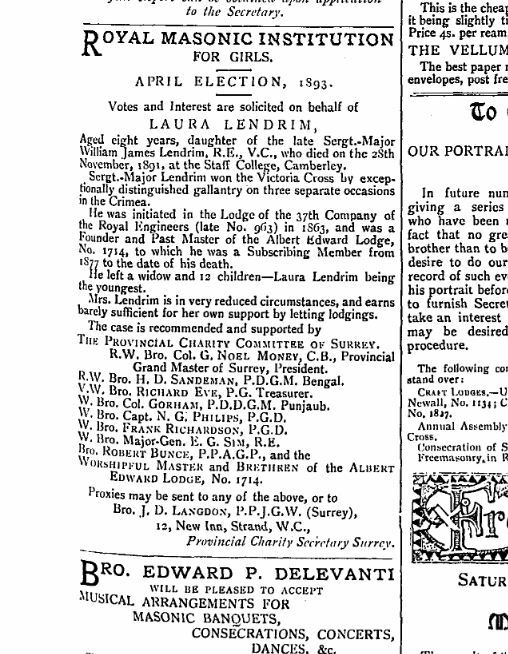 A copy of the solicitation for votes and interest on behlaf of Laura Lendrim can be seen to the left, the full copy of “The Freemason” dated March 11 1893 can be obtained by clicking the image of solicitation. “Albert Edward Lodge No. 1714 does not have a photo of W. Bro. William James Lendrim wearing his VC, although I believe one existed when our centenary history was written 26 years ago, but the author died recently. We do, however, have a photograph of him wearing military uniform under his regalia. He was among the first 62 recipients of the award, and was invested by Queen Victoria in Hyde Park at the very first ceremony. The story of W. Bro. Lendrim, who won the VC at Sebastopol, as one of the very first to win the award, may be of interest to all. 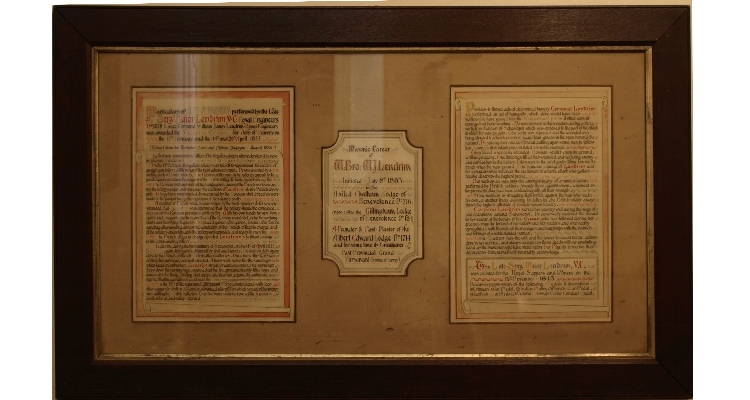 One of the items hanging in the stairwell is the record of James Lendrim’s actions , and the details of his masonic career. W.Bro William James Lendrim was initiated in Lodge of the Thirty-seventh Company of Royal Engineers, No. 963 on 8 July 1863 and passed on 12 August the same year. As the Lodge warrant was withdrawn on 22 February 1864, he was raised in United Chatham Lodge of Benevolence, No. 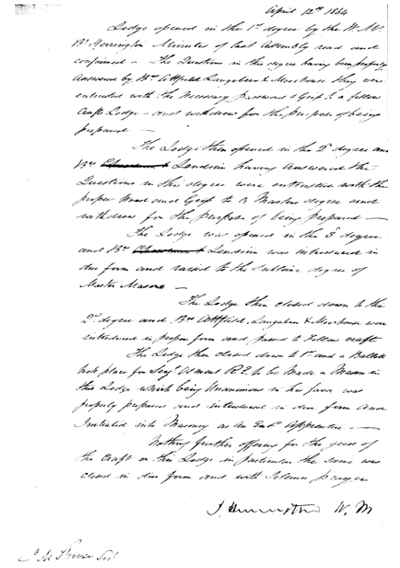 184, Chatham on 12 April 1864, resigning in November the same year.